Verizon "unlimited" subscribers have complained about YouTube and Netflix being throttled to 10Mbps, resulting in decreased video quality in some situations. Verizon later admitted to testing"optimizations", but denied that they had throttled the connection. In February of this year, major US carrier Verizon introduced a supposedly unlimited plan that boasted unlimited data, HD video streaming, and hotspot service. This past week, customers began to complain of capped speeds and affected video quality on two major video streaming services: Netflix and YouTube. When confronted, Verizon claimed they were engaging in temporary video optimization testing. Throttling is outlawed by current net neutrality legislation. While Verizon claimed the "optimization" didn't affect video quality, some users reported otherwise for YouTube. 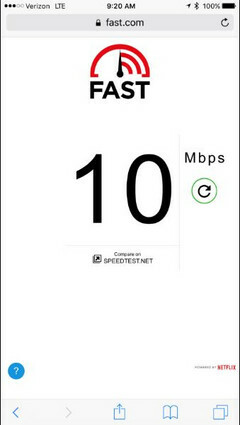 Not everyone would have noticed the problem with just video quality, but using a speed test that mimics video packets, such as fast.com, apparently triggers Verizon's throttling. Not all websites test data packets that look like video in order to prevent cheating by ISPs, so other websites, such as Ookla's Speedtest, reported speeds up to 82 Mbps when tested by ArsTechnica. According to comments on Reddit, using a VPN service will bypass the throttling. Verizon's website claims "This network management technology is designed to transmit data more efficiently, ease capacity burdens on the network, primarily from video files, and improve the user experience with faster downloads and decreased Internet latency," however, the company has insisted the "optimization" will be finished soon.